Again I was late getting into the Game Boy Advance. The jump from the monochrome Game Boy to Game Boy Color left me unimpressed. Sure, the color was a nice addition, but you can't see anything on that screen. With no backlighting and insane glare... it was a tough handheld to love. When the Advance came out, my nephew was very hyped on it so that sort of motivated me to check it out. Eventually, I got one an consicered it a good upgrade to GNC and it was backward compatible with all my Game Boy games. In 1996, magazines including issues 53 and 54 of Total! and the July 1996 issue of Game Informer featured reports of a new Game Boy, codenamed Project Atlantis. Although the expected release date of "early 1997" would make that machine seem to be the Game Boy Color, it was described as having "a 32-bit RISC processor" and "allowing similar to Super Nintendo Entertainment System standard games-playing to be played in the palm of your hand" - a description that more closely matches the Game Boy Advance. It also may have referred to the unnamed, unreleased Game Boy Color successor prototype that was revealed at 2009's Game Developer's Conference. Memory: 32 kilobyte + 96 kilobyte VRAM (internal to the CPU), 256 kilobyte WRAM (outside the CPU). Color support: 15-bit RGB (16-bit color space using 5 bits depth per channel), capable of displaying 512 simultaneous colors in "character mode" and 32,768 (215) simultaneous colors in "bitmap mode"
Backward compatibility for Game Boy and Game Boy Color games is provided by an 4/8 MHz Z80 coprocessor (which Game Boy Advance software can use the audio tone generators to supplement the primary sound system), while a link port at the top of the unit allows it to be connected to other devices via use of a Nintendo Game Link cable or GameCube cable. When playing Game Boy or Game Boy Color games on the Game Boy Advance, the L and R buttons can be used to toggle between a stretched widescreen format (240×144) and the original screen ratio of the Game Boy (160×144). Game Boy games can be played using the same selectable color palettes as on the Game Boy Color. The Game Boy Advance is also capable of hot swapping by pressing START and SELECT simultaneously on the start up screen. The Nintendo logo will vanish, and you can then safely remove a Game Pak and put another one in the slot. Press A and the Nintendo logo will reappear, and the Game Pak in the slot will load. Every Nintendo handheld system following the release of the original Game Boy Advance (SP and Micro versions of the Game Boy Advance, as well as the Nintendo DS, DS Lite, and DSi) has included a built-in light and rechargeable battery. On December 1, 2006, Nintendo of America released launch-to-date information indicating that the Game Boy Advance series had sold 33.6 million units in the United States. In a Kotaku article published on January 18, 2008, Nintendo revealed that the Game Boy Advance series has sold 36.2 million units in the United States, as of January 1, 2008. As of December 31, 2009, the Game Boy Advance series has sold 81.50 million units worldwide, of which 43.55 million are Game Boy Advance SP units and 2.42 million are Game Boy Micro units. After the Game Boy Advance's support lessened, the most popular software became mostly games oriented to younger gamers. The Game Boy Advance became the modern flagship of sprite-based games. With hardware comparable to the Super NES it had proven that sprite-based technology could improve and live side by side with the 3D games of the day's consoles. The Game Boy Advance not only has typical platformers, but also a huge collection of SNES-style RPGs. It has also become a popular system for old-school gamers due to the increasing number of games ported from various 8-bit and 16-bit systems of the previous eras, including the popular Super Mario Advance series, as well as its compatibility with all earlier Game Boy titles. Final Fantasy VI Advance was the last Japanese GBA game, released November 2006, the last Nintendo-published game for the system. The Legend of Spyro: The Eternal Night was the last European GBA game, released November 2007. Samurai Deeper Kyo was the last North American GBA game, released in February 2008. A yet-to-be-released SNK Metal Slug game for the GBA has also recently shown up on the Toys R Us website and price guide. Most GBA games are played with the character placed in the center of the screen, seen half from above in an ortographic wiew. Wireless Adapter: Released in 2004, this adapter hooks up to the back of the Game Boy Advance. It replaces link cables and allows many people to link together. It markets for US$20 and came included with Pokémon FireRed and Pokémon LeafGreen. Because it was released so late in the Game Boy Advance's life, fewer than 20 games support this hardware. The adapter's usefulness is most evident in Pokémon; FireRed/LeafGreen and Emerald feature a "Union Room" where up to forty people can enter to battle or trade Pokémon. A Game Boy Micro version has also been released; it can interact fully with both models of the Wireless Adapter. Game Boy Advance Infra-Red Adapter: This adapter was included with the game Cyberdrive Zoids, as it is only compatible with this game and the latest GBA Pokémon games. The adaptor was not sold separately. This is also currently the only Game Boy Advance accessory that has not been remade for the Game Boy Micro. Play-Yan: The Play-Yan is an MP3/MPEG4 player for the Game Boy Advance and Nintendo DS. The cartridge is slightly broader than a normal Game Boy Advance cartridge and includes a built-in headphone port as well as an SD Card slot. Music or videos that users have downloaded from the Internet can be transferred onto an SD Card and slotted into the Play-Yan device. Nintendo has released several mini games for the Play-Yan that can be downloaded from their website, although Nintendo later removed all minigame functionality through a firmware update. The Play-Yan was initially available in Japan only, but was released in Europe as the Nintendo MP3 Player on December 8, 2006, with the MPEG4 functionality removed. The Play-Yan was never released in North America. e-Reader: The e-Reader is a rather bulky scanning device that plugs into the game cartridge slot of the Game Boy Advance. Specialized cards with codes along the side and bottom are slid through the slot, scanning the card into the Game Boy Advance. Many ideas for the e-Reader include cards that scan classic games like Donkey Kong and Excitebike onto the handheld ready to play, as well as a collaboration with Super Mario Advance 4 and Pokémon Ruby and Sapphire to have cards that unlock content. Nintendo GameCube games like Animal Crossing have cards with unlockable content as well, and the Pokémon Trading Card Game playing cards also adopt the e-Reader codes. The e-Reader works with the Game Boy Player and Game Boy Advance SP, but cannot fit into the Nintendo DS's Game Boy slot (however it can fit into the Nintendo DS Lite's Game Boy slot). Nintendo continues to manufacture the accessory and sell it at its Online Store. It is still quite popular in Japan. It was not released in Europe. Game Boy Advance Video: These cartridges contain two episodes of thirty minute cartoon programs. First released in North America in May 2004, these cartridges included cartoons such as Pokémon, SpongeBob SquarePants, Sonic X, Teenage Mutant Ninja Turtles, and Yu-Gi-Oh!. The movies Shrek, Shrek 2, and Shark Tale are also available for Game Boy Advance Video and all three movies are full. Due to the Game Boy Advance screen ratio, the three movies are in their widescreen format. These cartridges display an error when inserted into a GameCube via a Game Boy Player. 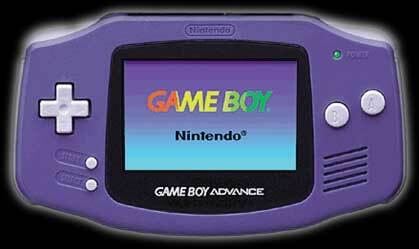 The Game Boy Advance Videos are no longer available at most major retailers. The Game Boy Advance, SP, and Micro had numerous colors and limited editions.